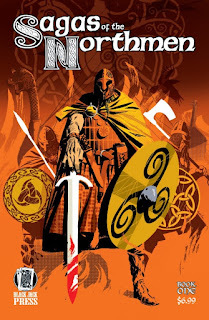 The Fellowship was fortunate enough to obtain a copy of SAGAS OF THE NORTHMEN BOOK ONE from Black Jack Press. Writers include Sean Fahey, Mark Wheaton, Tom Pinchuk, Derek Fridolfs, Ken Jones and Susan Wallis. Artists include Jok, Borch, Marcelo Basile, Ezequiel Rosingana, Michael Kennedy and Todor Hristov. An English town views a Viking raid as penance for its sin. A blacksmith is banished for murder, but there may be more to it. A warrior survives a shipwreck only to face the wrath of an old enemy. A young, untested king takes a chance to secure the loyalty of his people. A young wife takes up her husband’s mantle of leadership in a dire situation. A palace guard is tempted, but shows his foes what loyalty means. This collection of short stories gives us a taste of some of the variations of Viking folklore. These are (mostly) fictional, of course, but they emphasize the nobility and honor of the warrior lifestyle (and sometimes the other side), and show us what people must do in a medieval setting to survive. These stories do a delightful job of expressing those complicated concepts, and the art adds the stark beauty of the harsh landscapes of northern Europe. This is a book that’s probably best enjoyed on a cold, rainy night, and should certainly not be devoured too quickly. Let each story sink in, and you will be pleased with the result. 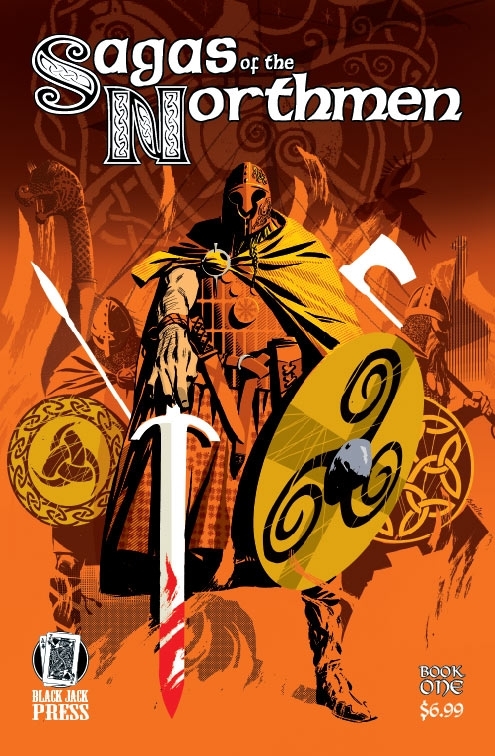 SAGAS OF THE NORTHMEN BOOK ONE is available now at your FLCS or at drivethrucomics.com.